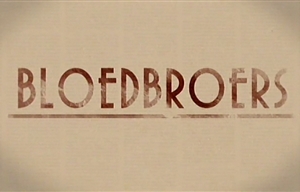 Bloedbroers (Blood Brothers) is a South African, Afrikaans-language period drama television series created by Deon Opperman which follows the lives of four friends - a gang of blood brothers - all in their early twenties at the beginning of the story. The series is set against the background of the turbulent socio-political events of the 38 years between 1914 and 1948: the rebellion, the First World War, the miners' uprising of 1922, the Depression of the 1930s, World War II, the election of 1948 and the ongoing tension between supporters of "Sappe" and "Natte". During the course of the story we see how the deep ties between the men are tested, destroyed, rebuilt and radically changed by the changing political beliefs, personal ambitions, romantic relationships and the tough choices they have to make to survive. Bloedbroers was intended as the first in a new Afrikaans trilogy in the spirit of Deon Opperman's previous Afrikaner Trilogy drama series - Donkerland (Dark Country), Kruispad (Crossroads) and Hartland (Heartland). The series is from Deon Opperman Productions and is Produced by Deon Opperman and Soné Combrinck, with Marguerite Albrecht serving as supervising producer for kykNET. The series is based on a concept by Deon Opperman with screenplay by Opperman and story development by Opperman, Jozua Malherbe and Sean Else. The director was Jozua Malherbe and the title music was composed by Janine Neethling.